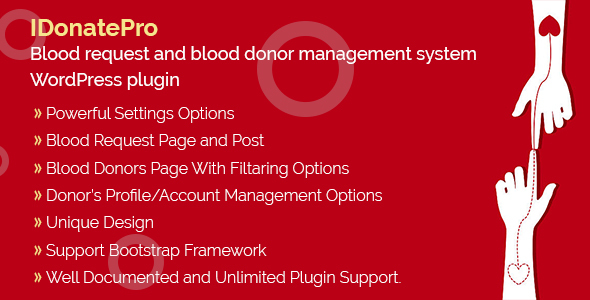 iDonatePro is a professional Blood request and blood donor management system for any kind of WordPress website. This plugin will allow anyone to registrar for donate blood and the list of donors will automatically populate on donors page. Also anyone who need blood they can find the easily also they can request for blood. It has very nice UI and powerful admin settings panel what is very easy to use. It can be also set into Widgets of WordPress. This plugin is suitable for any donation, non-profit, clinic, hospital, doctors websites who want to provide some extra facilities to help find blood.